A helpful guide on all things Cisco Do you wish that the complex topics of routers, switches, and networking could be presented in a simple, understandable presentation? 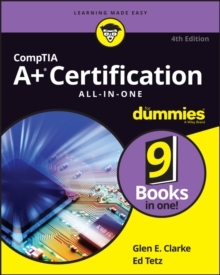 With Cisco Networking All-in-One For Dummies, they are! This expansive reference is packed with all the information you need to learn to use Cisco routers and switches to develop and manage secure Cisco networks. This straightforward-by-fun guide offers expansive coverage of Cisco and breaks down intricate subjects such as networking, virtualization, and database technologies into easily digestible pieces. 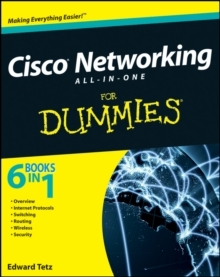 * Drills down complex subjects concerning Cisco networking into easy-to-understand, straightforward coverage * Shares best practices for utilizing Cisco switches and routers to implement, secure, and optimize Cisco networks * Reviews Cisco networking solutions and products, securing Cisco networks, and optimizing Cisco networks * Details how to design and implement Cisco networks Whether you're new to Cisco networking products and services or an experienced professional looking to refresh your knowledge about Cisco, this For Dummies guide provides you with the coverage, solutions, and best practices you need.